UNITED NATIONS, May 18, updated -- As the UN Security Council convened Tuesday at 4 o'clock for the belated distribution to members of the draft Iran sanctions resolution, whether the U.S. had played its cards right was the question of the hour. Vice President Joe Biden had said the resolution would be passed by the end of April. Then other Administration sources said that, out of respect for the complex internal politics of Lebanon, the Council's president for May, it would wait for June. But Turkey's and Brazil's foray to Tehran, and deal about exchanging uranium with Iran, forced the sanctions proponents' hand. A Turkish diplomat told Inner City Press on May 17, what's the need for sanctions now? It seems clear Turkey will not vote for them, and neither will Brazil. 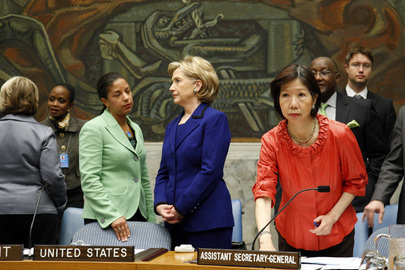 Hillary Clinton on Tuesday morning told the Senate that the draft resolution -- agreed to by China and Russia she said -- would be distributed to the non permanent Council members later in the day. The US Mission to the UN then invited select reporters for a briefing by Ambassador Susan Rice, saying it was embargoed until 4 p.m.. Major foreign correspondents, including from the Middle East, were not invited. Some joked that they must be, in the U.S. view, "non permanent" correspondents. Most opined that if the U.S. got China to agree so quickly, the sanctions must be extremely weak. The appearance of action is perhaps more important at this time than action itself. Watch this space. Update of 4:25 p.m. -- the new press pen is standing room only, and no TV cameras are allowed to film the entrance of the Ambassadors. As the French go in, Deputy de la Riviere mugs for the crowd: oh la la. Brazil's Ambassador rushes in. There are predictions of between half an hour and an hour of consultations. The stakeout is ready. Update of 4:36 p.m. -- a brief descent into substance: some question why Iran would go forward with the uranium swap it agreed with Turkey if the Security Council votes for sanctions at this time. To others this sounds like an argument made in China. Update of 4:41 p.m. -- a diplomat emerging from the Council tells the Press, it's not really a resolution that they've distributed. Reporters penned in crane to hear. Inside and out, there are translation problems. Update of 4:51 p.m. -- translation issue explained: a P-5 spokesperson emerges to clarify that the translation equipment did not work. The document (this P-5er IS calling it a draft resolution) was distributed, and a speech began. Then the equipment didn't work. Update of 4:53 p.m. -- Brazil's Ambassador emerges and says, there is a new situation with the swap. This is the time for negotiations. Update of 4:57 p.m. -- Brazil's Ambassador speaks to Brazilian TV. Others -- CNN, Al Jazeera -- shout, "to the stakeout please! In English!" But all politics are local. Update of 5:11 p.m. -- suddenly reporters want to know the name of the Ambassador of Brazil, who's been on the Security Council for five and a half months. Maria Luiza Ribeiro Viotti, we hardly knew ye! Update of 5:24 p.m. - in the lull, there is this ABC "blog" listing elements, quoting a "senior UN official." Update of 5:57 p.m. -- in serial stakeouts, the Ambassadors of the US, France, UK, Russia and China spoke. 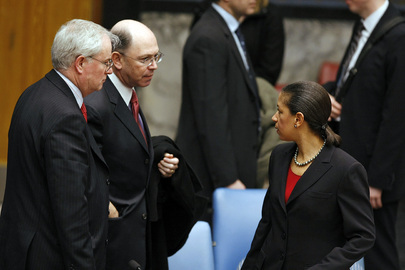 The US's Susan Rice spoke of language -- "preambular" -- about investing in Iran's energy sector. She could only two questions, chosen by her spokesman: Al Jazeera and Canadian Broadcasting Corp (some guessed, to make up for a lack of internationalism in their afternoon invites). Inner City Press asked China's Li Baodong if his country would feel constrained against investing in Iran's energy sector by this language. 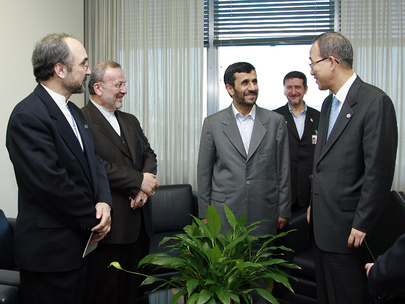 He said that the purpose of sanctions is to bring Iran to the table, not to punish normal people. This apparently means: Chinese investment in Iran's oil sector would continue. Then Li Baodong was gone, an exclusive offered to Xinhua News Service. There will be negotiations "at the expert level" in the coming days. Watch this site. Update of 6:06 p.m. -- but wait! There's more! Turkey's Ambassador leaves the chamber, and reporters, mostly for Japanese media, follow him up the stairs. He pauses, speaks of "CBM." Some scratch their heads: continental ballistic missiles? No -- it's Confidence Building Measures! Outside it is raining.